Weather: Beautiful, sunny and flat calm morning which clouded over and started to blow at midday. 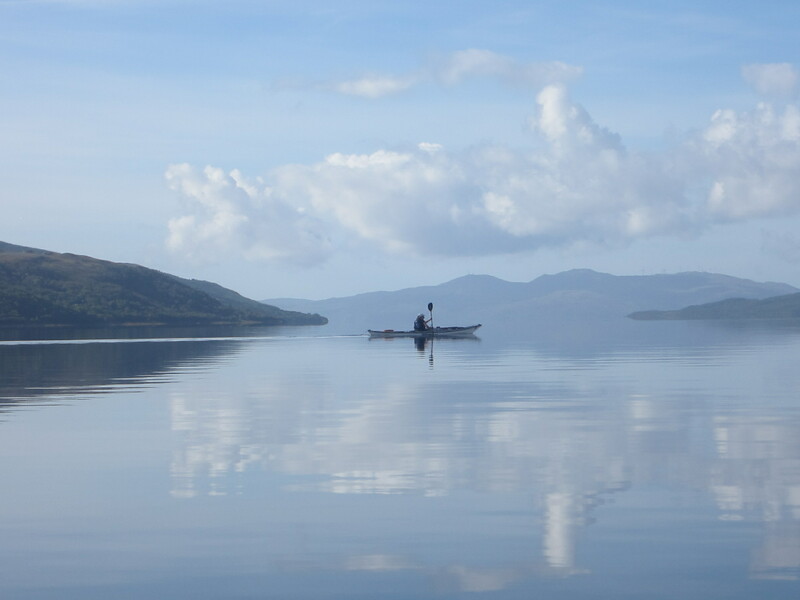 Report: We met at 10am at the car park opposite Old Lachlan Castle on a beautiful flat calm day. 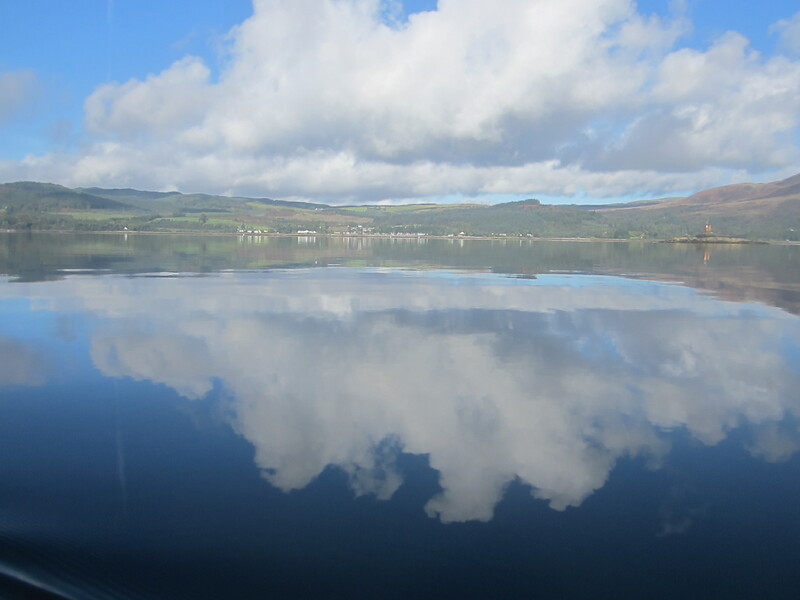 The tide was right out so after a short walk we floated the boats out down the river to the main loch. The morning was made for photos. Our first stop was Minard Castle. 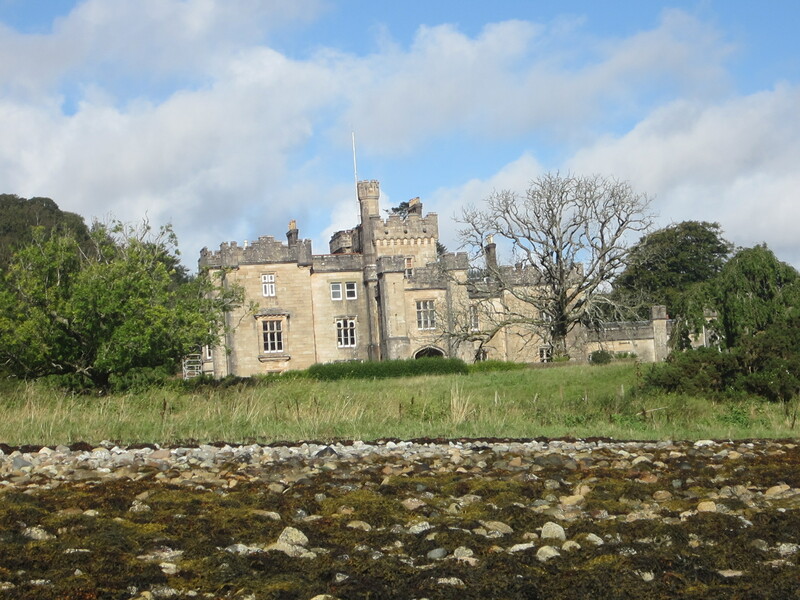 Built by the Campbells of Knockbuie in the eighteenth century, Knockbuie House was renamed Minard Castle in the mid-nineteenth century, when a new castellated front was added. After periods as a hotel and then up-market B&B it is now a private house. After a welcome coffee we headed on south into an increasingly strong wind, the objective being Loch Gair. We expected to have a number of wonderful beaches for lunch but ended up sitting on a rapidly flooding shingle bank. After lunch we set off again back across the loch. 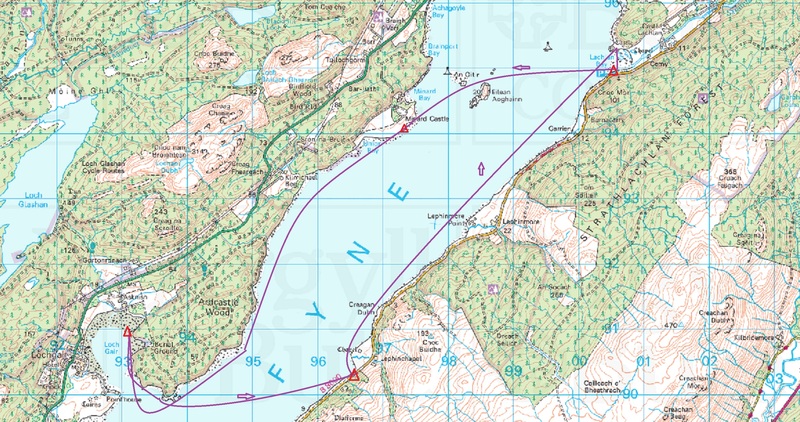 The original plan of a direct line back was swiftly abandoned as it became clear that our least experienced paddler was unable to cope with the rough seas. As in so many cases, instability and lack of directional control led to “dipping” rather than paddling resulting in lack of progress, further instability and even less control. 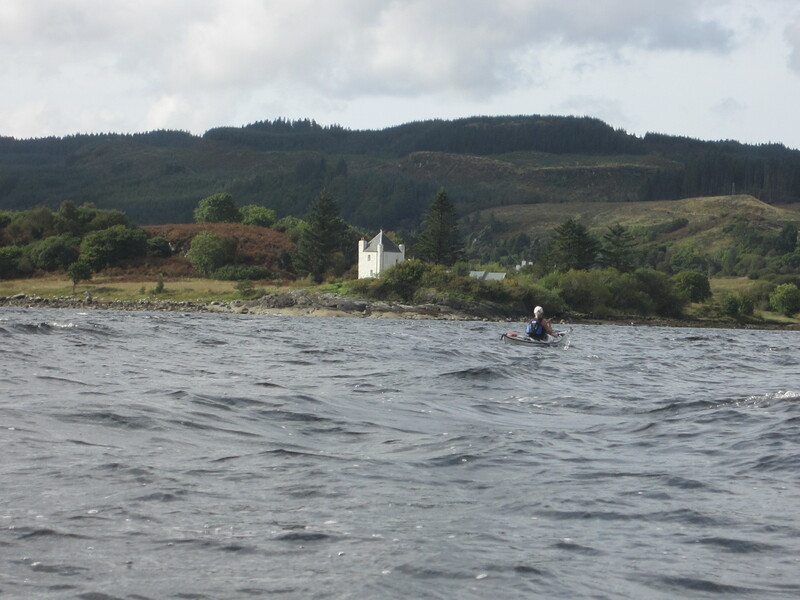 As we slowly progressed across the loch the problems seemed to mount for the paddler until Pete decided that a tow was required, primarily to stop the boat broaching and allow some progress. 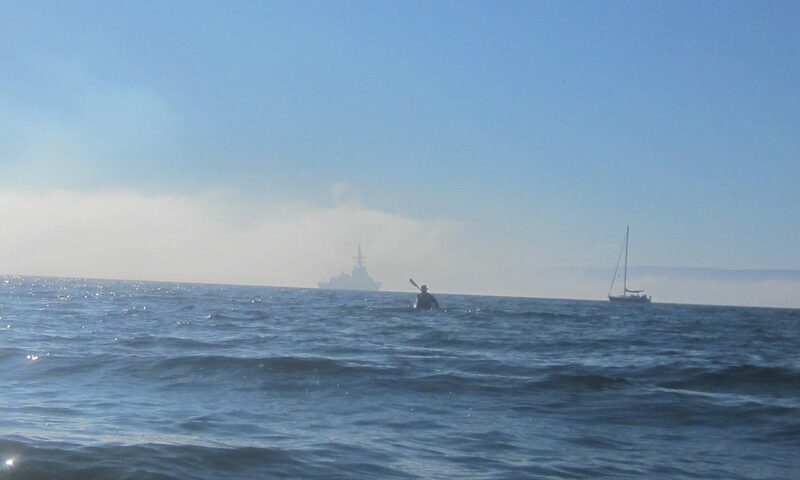 It also allowed a second experienced kayaker to raft up alongside to try to improve morale (and stability). It should be said that at the time some of us doubted the wisdom of a tow but now concede that this was actually the most appropriate action. 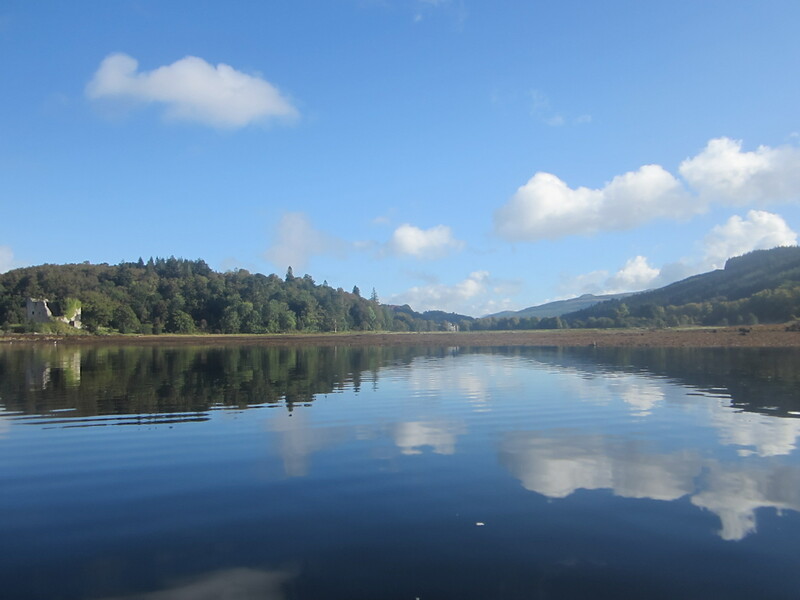 When we reached the other side our shaken novice was landed with a flask of coffee whilst we headed back up the loch to the vehicles. The paddle back up was excellent with a strong push by the wind and tide, although the following waves were rarely big enough for surfing. 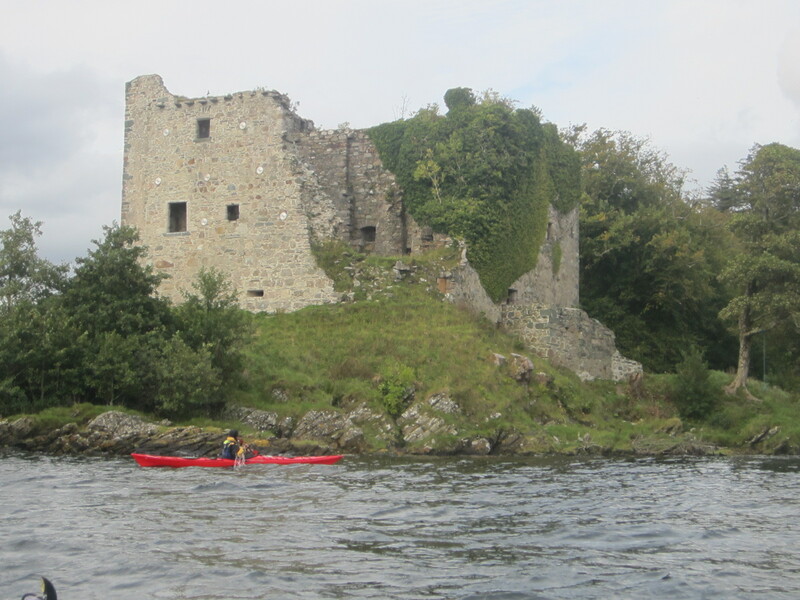 We covered the 8km in about an hour, enough time to have a quick inspection of old Castle Lachlan from the sea. The Old Castle is a fifteenth century fortress occupying a rocky headland overlooking Lachlan Bay on the east side of Loch Fyne. It was the major building of the local clan, the Maclachlans. There has been a castle on the site since at least 1314. The old castle fell to ruin after the Clan of Maclachlan supported Bonnie Prince Charlie in the 1745 Jacobite rebellion. Their chief joined the Prince’s army but was killed at the ill fated Battle of Culloden (1746). Back at the car park the high tide substantially eased kayak loading and we eventually left to pick up our fifth paddler just after 5.45. This was completed without a problem and we were back in Rhu by 7.30 after an excellent day with all of us a little wiser.